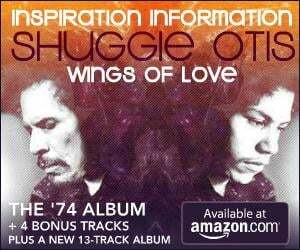 Blues and R&B musician Shuggie Otis is back with a new album for the first time in almost 40 years. For the reclusive Otis, the release of Wings of Love is major news. Its release is paired with his 1974 masterpiece Inspiration Information. On World Cafe, Shuggie plays some of his recent material with his band, and talks about how he developed the cornerstone of Inspiration Information using a drum machine. Listen to Shuggie Otis on World Cafe. The son of R&B royalty Johnny Otis, singer-songwriter Shuggie Otis made a name for himself in the hippie era through works like his psychedelic hit “Strawberry Letter 23.” He even was invited to join The Rolling Stones at one point, though he turned down the offer. … Epic Records finally reissued Otis’ classic 1974 work, Inspiration Information, and he began performing at venues like the Echoplex and El Rey. After years of sampling by prominent hip-hop acts like OutKast, Otis’ music sounds more relevant than ever. Our friends at Paste spent the day with Shuggie Otis as he prepared for and performed in concert at The Blockley in Philadelphia. This image by photographer Doug Seymour captures Shuggie on stage. View this and more photos at PasteMagazine.com. Getting snubbed by record labels for decades is surprising, considering his pedigree and the size of his network. He’s the son of late R&B pioneer and Rock and Roll Hall of Famer Johnny Otis and grew up learning from guitar legends like Don “Sugarcane” Harris and Al Kooper, just a couple of the artists who walked into his father’s home studio. Read more of the Shuggie Otis interview at USA Today.